Was it a mistake to reveal who killed Laura Palmer? Sometimes an opinion gets repeated over and over again in the constant feedback loops of internet fandom and critical discourse until finally they become a sort of unquestioned consensus indistinguishable from fact. The following statement is an example of this: “Twin Peaks should have never told us who the killer was.” We all know the arguments, right? It was never meant to be revealed. David Lynch did not want to do it, but the network forced his and Mark Frosts’ hands. And once the mystery was solved the show lost its’ way, unable to find its’ footing for a long time before finally getting itself back together again, only to find that it was too late – the cancelation inevitable. Perhaps all of that is true in a way. I have certainly believed it at times during my long history as a fan of the show. But as time has passed I have come to revise that belief somewhat. Because I have a hard time imagining what that alternate reality version of Twin Peaks might have been like – a version of the show that never told us the identity of the murderer. An alternate reality, presumably without “Fire Walk With Me”. An alternate reality where we still would not know. Let us look at the second season as it in fact is. As we know it consists of 22 episodes. Maddie is killed and we find out that Leland is Bob in episode 7; Cooper solves the whole thing two episodes later, in episode 9. How did the show end up there? The story has often been told like this: Twin Peaks first season (a mid-season replacement of only 8 episodes) is a huge hit, much bigger than anyone anticipated. The zeitgeist is suddenly all about coffee and pie. Then season two premiers (a full 22 episodes now ordered) and David Lynch and Mark Frost still intends to keep the mystery unsolved. But the ratings begin to fall off. The network panics and starts pushing to solve the case. The creators are forced to go along with this and have to scramble to tie up that storyline. It is a compelling timeline but the thing is – I don’t buy it. 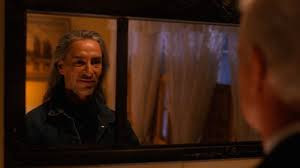 In fact in hindsight I think it is quite clear that Lynch and Frost are setting up the murder of Laura Palmer to be resolved from the very beginning of the season. Via the Giant the supernatural elements of the show, previously more of a background note, are placed front and center. This leads to the focus shifting to the demon-spirit Bob as a major “person” of interest rather than any flesh and blood suspect. In fact the first episode of the second season ends with a harrowing flashback to the murder and we actually see Bob committing the crime. Really at this point, we already know who the killer is; we just don’t know how all the pieces fit together. At the same time we get the major shift in Leland’s’ character from obsessively grieving father to song-and-dance-man-maverick in preparation for what is to come. Linked to this is also the notion that there is a connection between Leland and Bob from childhood, another fact we learn in these first episodes. Thirdly, in the first two episodes Maddie has a series of terrifying visions (one of which is the scariest moment in the show); clearly establishing that she is soon to be the next victim. To all this we can also add the novel “The Secret Diary of Laura Palmer” written by Jennifer Lynch, published before the start of the second season. Jennifer Lynch was informed of who the killer was and the book certainly also places Bob smack in the middle of the events. My point here is that none of these moves makes any sense if you intended not give the murderer away. If that was your goal you would introduce new red herrings, new alternative suspects, other circumstances that would complicate the case – in other words more noise and less signal for Cooper and Truman to sift through. I am not sure that would have worked though, and I am quite convinced that the show would have been worse, not better with such a narrative strategy. I can see the show maybe holding off on the reveal a few more episodes but not much more than that. It is intriguing to imagine a world where the second season of Twin Peaks had been 8-10 episodes long, the standard length for prestige television today. The final act of the episode when Maddie is killed could then have been the season finale. It sure feels like one. But it is difficult, I think, to figure out a version of the show where that would have been postponed all the way until S02E22. The creators would then have had to introduce something else, something so important that the murder investigation would have had to be put on the backburner for a while (That something I suppose could have been Windom Earle. He is also introduced in the second episode of the season – another sign that Frost and Lynch knew they were going to need a new thing to investigate down the line.) Again though – would such a version of the show really have been more satisfying, less frustrating and less off putting to a casual audience? I don’t think so. It might be instructive here to compare Twin Peaks with something like Lost, another mystery driven genre-mixing TV-show from the past decades. Now Lost had its’ own set of problems and I am not going to get into whether or not it was ultimately successful here but it was at least able to sustain itself for six seasons. Both shows seemed to revolve around a central mystery but mysteries of different kind. Whereas the question of Twin Peaks, at least as far as the marketing told us, was “Who killed Laura Palmer?” the question of Lost was “What the heck is going on with this weird island?”. Those are two very different kinds of questions. Where the question of Twin Peaks begs a sort of binary answer (we either know who it is, or we don’t) the Lost-question is completely open ended. The longer we spend on the weird island the more strangeness we can discover. There is always another door behind the one we just opened. That is the mystery that can sustain itself where as a whodunit really can’t. In real life an unsolved murder doesn’t stay in the headlines. It fades away, eventually becoming a cold case. Every now and then the case is brought back to attention, the facts are mauled over and rehashed but really nothing new is added. Even those who obsess over these cases (like Ripperologists or the Jake Gyllenhaal character in Finchers’ Zodiac-movie) seem to be driven more by frustration than anything else. It is not a pleasurable place to be. So really, the question of Laura Palmer and her murderer could not be a sustained mystery. Nor was it the real question of the show. The murder was a way in, an initial introduction to the world but the real question, I would argue, was all along something much more like that of Lost: “What the heck is going on with this weird town?”. That is a mystery that CAN sustain itself. But in order to get there we had to leave the murder behind us. We had to find out. Only then could we expand the mythology and discover things about the White and the Black Lodge. I, for one, would not have wanted to miss out on that stuff. I am not going to argue that the aftermath of the reveal could not have handled better. That being said, Twin Peaks was a very special show, with a very special balance of tones. I certainly do not pretend I know what I would have done differently. (Except for the plot with James and his Wild Ride.) To throw us headlong right into Window Earle without any build up doesn’t seem like a good solution either. Let us not forget – Twin Peaks was a sort of show that should not have been possible at all in the world of mainstream television in the early nineties. There was no template for this. So I don’t think it was a mistake to reveal the killer. We are told that David Lynch disagreed. Maybe that is true, although I wonder if his opposition has not been embellished a bit over the years. It seems clear, at least to me, that he and Mark Frost knew going into the second season that it had to be done. And the way that Lynch directs that seventh episode, the one where Maddie dies, is a real tour de force from a director at the top of his game. Shot after shot is filled with beauty, horror, sadness and all of it is put together in the most intense and mesmerizing way. It is one of the best things Lynch has ever done. Would we really want Twin Peaks without that?